Experience the magnificence of Prague by night on a dinner river cruise, as a live band entertains with a selection of jazz music and popular tunes. As we journey upstream, passing under Charles Bridge and through the lock, participants will enjoy unique views of this beautiful city. With the Old Town on one bank and the picturesque Lesser Town on the other, many of Prague's famous sights border the river. Take in the stunning views of Prague Castle, Rudolfinum, Prague Parliament, National Theatre, Dancing House and Vysehrad. The river cruise includes a high quality 3 course buffet dinner, featuring a wide choice of hot and cold food. The musicians play during and after dinner, setting the scene for you to relax, to enjoy the food and the music, and the splendour of the city all around you. 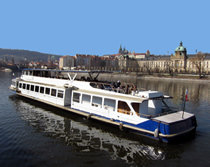 This Prague by night dinner cruise is the best value buffet cruise in Prague. It is our most popular boat trip, for which we receive excellent customer feedback. River cruise + Welcome drink + 3 course buffet dinner + Live band.